James Franco’s career is full of hyphens, as he’s a writer-director-producer-actor-social media weirdo, to name just a few things. We can add fictional clairvoyant to that list now, thanks to Franco’s appearance on an episode of 30 Rock where he seems to magically predict the current state of affairs involving Sony’s currently shelved comedy The Interview. Take a look at the admittedly low-quality video below. Okay, so this isn’t the strictest form of prophecy out there, but I’d easily say it’s a better example of forethought than any random nonsense Nostradamus ever put in quatrain form. Franco wasn’t talking about The Interview in particular, and was really just portraying an even more insane version of himself for the cartoonish NBC comedy. Still, this is a pretty specific throwaway line. Instead of Seth Rogen, his faux co-star in this case is Jenna (Jane Krakowski), and the film is actually just part of a cover story where he’s dating Jenna to fool the press. He’s actually throwing attention away from his affection for his Japanese body pillow, Kamiko, though he says he’s not in love with the doll at all. He ended up sleeping with Liz later in the episode. 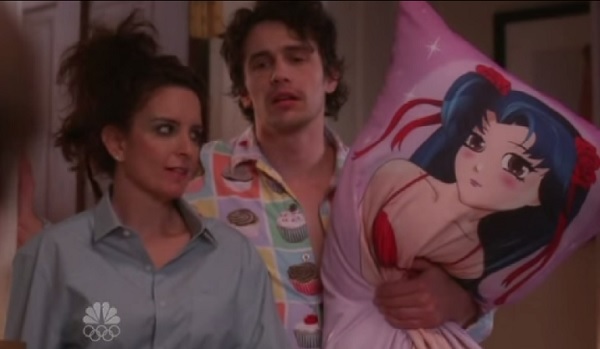 So, for those taking score, if Franco ever sleeps with Tina Fey and/or adds an anime pillow to his entourage, the Season 4 30 Rock episode “Klaus and Greta” could rightfully serve as a religious prophet. I’m not sure what religion, mind you. The Franco-ternity of the Inner Light? That 30 Rock quote doesn’t fully go into all of the ridiculous things that have gone on in the days following the Guardians of Peace hack and subsequent threats against Sony, which led the studio doing everything possible to disassociate itself from Kim Jong-un-assassinating The Interview. Sony cancelled all theatrical screenings of the film once terrorist threats came into play, going so far as to claim the comedy wouldn’t even get a Blu-ray or VOD release. Many have come forward to try and get the film distributed – both with and without Sony’s help – including George Clooney and BitTorrent. But the hackers’ latest message to Sony claims they’ll cease future leaks as long as The Interview remains unseen by mass audiences. So they likely won’t agree to let anyone else screen it in the near future. Maybe I’ll go back and watch 127 Hours tonight to see what Franco the Great has to say about the next month of entertainment news.